The torsion axle is your answer to a smooth riding trailer. Torsion axles utilize rubber torsion cords inside of the axle tube which offer a one piece suspension and axle assembly. Torsion axles offer independent wheel suspension and less road vibration while requiring less maintenance. Torsion axles install by bolting or welding the axle directly to your frame. These axles are available in weight ratings from 600 to 10,000 lbs. Torsion axles are made for a variety of towable applications including RVs, utility trailers, horse and livestock trailers and dump and heavy equipment trailers, argicultural equipments, ect. Our axle assemblies are traceable down to the exact production run and original component lot number. One of the main torsion alex is the torsion arm. 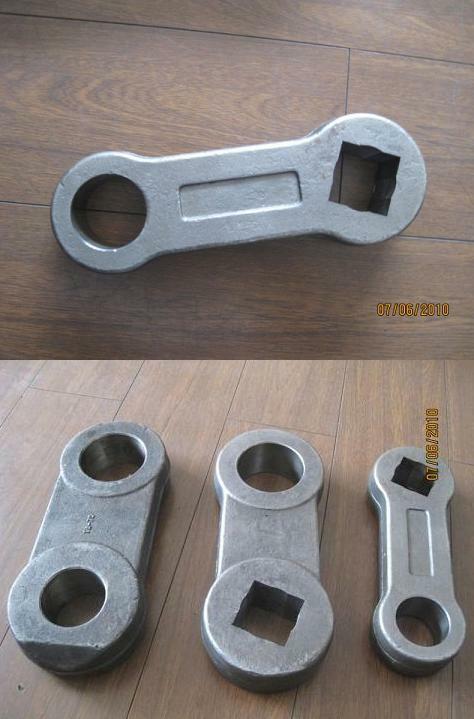 To ensure enough strength and good quailty, such torsion arm is designed in closed die forging process. The forging process adds strength to the torsion arms allowing it to twist back and forth over the lifecycle of the vehicle. Forged torsion arm will make torsion alex more stable and work longer. Material of torsion arm is steel, Fly Drop Forge manufactures torsion arms in a variety of shapes and sizes for several different applications. Fly's torsion arm forgings are made with minimal parting lines and can be eliminated completely. Pls contact us and send your torsion arm drawing and we will be happy to send a quote for you.